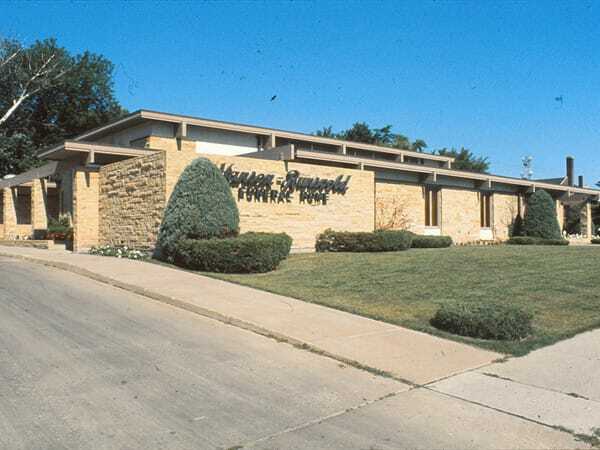 Hanson-Runsvold Funeral Home has been active in serving families in the Fargo-Moorhead and surrounding area since the 1920's. 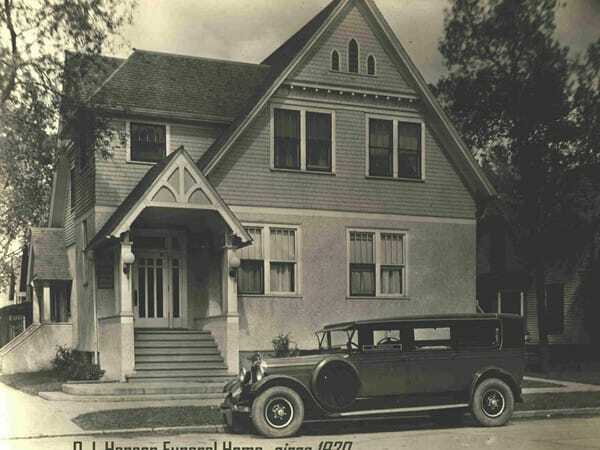 Originally the Hanson Funeral Home was located on Roberts Street and Fourth Avenue North. Long-time businessman, O. J. Hanson, founded it after World War I. Shortly after World War II, J. D. Runsvold purchased the business from the Hanson family and retained the Hanson name. J. D. was active in the business for many years with his son, James D. Runsvold, and Neal S. Bradburn. 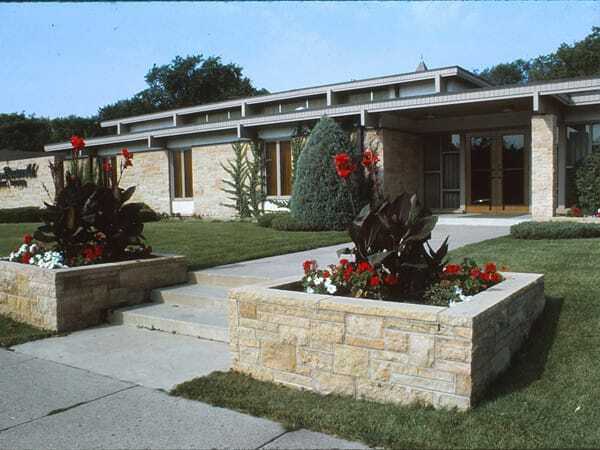 In 1960, construction of a new, modern funeral home started at the current location near Island Park on Seventh Street South and continues to operate under the direction of John D. Runsvold, third generation funeral director. 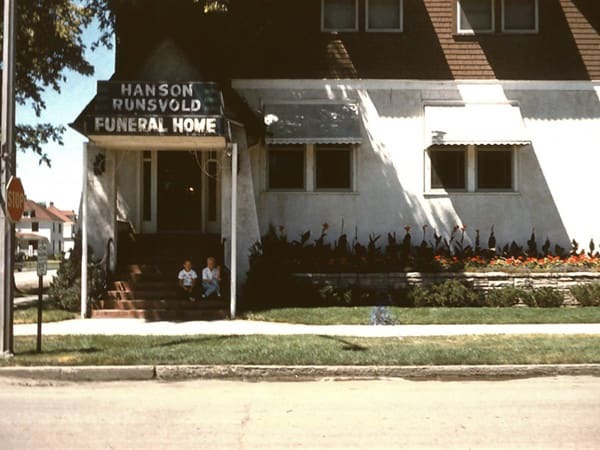 John Runsvold, licensed funeral director and owner of Hanson-Runsvold Funeral Home, grew up in Fargo and graduated Fargo North High School in 1971. John attended North Dakota State University, for two years, before graduating from the University of Minnesota in Minneapolis, with a B.S. degree in Mortuary Science. In 1975, he joined his grandfather Joseph, his father James, and Neal Bradburn at Hanson-Runsvold. John and his wife, Cydney, have owned the funeral home since 1982. He is active in the F/M community, including past president of the Fargo-Moorhead Sertoma Club, past Master of East Gate Masonic Lodge and past president of Hospice of the Red River Valley. He is active in First Lutheran Church, including past president of the foundation, past chairman of the television committee, past member of the properties committee, the church council and youth committee. He also served on the University Lutheran Center Board at North Dakota State University. In 2013 he was inducted into the Fargo North Hall of Fame and was named Honorary Chairman of the North Dakota Open. John is currently involved with the Fargo/Moorhead Pancreatic Cancer Awareness Group and The Angel of Hope group of Fargo. John has been active on the state level serving as Southeast District Governor and past President of the North Dakota Funeral Directors Association. He served the state of North Dakota as a member of the North Dakota State Board of Funeral Service for ten years, and is a past president of that board. He has been involved on the national level with the National Funeral Directors Association, serving on the audit and pursuit of excellence committees. He served on the national board exam, by-law, executive, international and education committees of the International Conference of Funeral Service Examining Boards. He is past district governor and past president of that board. He served on the Committee on Accreditation of the American Board of Funeral Service Education and is a former member of their by-law and curriculum review committees. John also served on the American Red Cross Tissue Donation Liaison Committee. John and his wife Cydney have a son, Jordan (Jeny) Runsvold; two daughters, Rachel Blankenship and Lauren (Jay) Siebels; and 6 grandchildren, Emily and Jack Runsvold, Jett and Lillian Blankenship and Emmett and Harper Siebels. John and Cyd make their home in Fargo. Cyd Runsvold is the Marketing & Public Relations Director for Hanson-Runsvold and is the co-owner of the firm with her husband, John. She also continues to work as a Pharmacist at Northport Drug in Fargo. Cyd is the daughter of Doug & Lil Stoelting, grew up in Fargo and graduated Fargo North High School. Cyd received her Pharmacy degree from North Dakota State University in 1977. She is active in the community, currently serving on the Red River Youth for Christ Board of Directors, the NDSU Alumni Association Board and enjoys supporting the NDSU College of Pharmacy. She served on the NDSU search committee responsible for hiring Athletic Director, Gene Taylor. Cyd also served on the High School Girls Hockey Association Board for Fargo Schools, responsible for launching the sanctioned North Dakota High School Girls Hockey Program for Fargo. Among other interests, Cyd has served on the F-M Symphony Guild Board, the F-M Sertoma Auxiliary, First Lutheran Church Council and Building Committee, as chairman of the Youth Committee, Fargo Country Club Building and House Committees and various committees with the Fargo Public Schools. She is an active member of P.E.O. in Fargo. Cyd and her husband, John, have a son, Jordan (wife, Jeny) and two daughters, Rachel (Jared) Blankenship and Lauren (Jay) Siebels, and 5 grandchildren Emily and Jack Runsvold, Jett and Lillian Blankenship and Emmett Siebels. They make their home in Fargo. Jacques Boucher, Licensed Funeral Director and Manager of Hanson-Runsvold received his Bachelor of Science Degree in Mortuary Science at the University of Minnesota in Minneapolis in 1996 after careers in law enforcement and Emergency Medical Services. He worked in Detroit Lakes for two years before joining the Hanson-Runsvold staff in 1998. Aynsley (Odegard) Gunnerson, Minnesota and North Dakota Licensed Funeral Director, has been with Hanson-Runsvold since November 2005. She attended high school and college in Anoka, MN. She graduated from the University of Minnesota with a Bachelor of Science degree in Mortuary Science in May 2004. She resides in Fargo with her daughter and husband where they are members at Immanuel Lutheran Church of Fargo. On October 12, 2012, Aynsley married Scott Gunnerson. Scott is originally from Crookston, MN and he works as a Journeyman Electrician with Hope Electric. His parents are Jim and Gayle Gunnerson of Laporte, MN, formerly of Crookston, MN. In her free time, she enjoys spending time with her family, dog, and three kitties, watching movies, and decorating their home in Fargo. Alex B. Rydell joined the Hanson-Runsvold staff in May 2007 as a funeral director intern. In July, 2008 he became a licensed funeral director in both North Dakota and Minnesota, and was hired as a Funeral Director at Hanson-Runsvold. Alex was born and raised in Fargo, ND, and graduated from Fargo North High School in 2002. After briefly pursuing a music degree at St. Olaf College in Northfield, MN, he found his true calling was in the funeral profession. He spent the next two years at the University of North Dakota after which he entered the University of Minnesota – TC Program of Mortuary Science. He graduated from UMN in May 2007 with a Bachelor of Science Degree in Mortuary Science. His love for music is still very prominent in his life, as he plays fiddle in the local Irish band “Poitin” and is also an active musician at First Lutheran Church of Fargo. His passion is serving the Fargo-Moorhead community through the ministry of funeral service and is grateful for the opportunity he has to help families honor the lives of their loved ones in a meaningful way. Alex is currently the President of the North Dakota Funeral Directors Association. Polly Wendelbo is a member of our Support Staff at Hanson-Runsvold. In addition to assisting the funeral directors and families at funerals, she also works with Leah and John at community events. Polly and her husband Carl, attend Calvary United Methodist Church. They have one married son and a daughter-in-law. Keith joined the Hanson-Runsvold team in September of 2014. He and his wife, Pat, relocated to Fargo, ND from Dickinson, ND upon Keith retiring from Job Service ND after 36 years of service. He wanted to continue working with people in a professional manner and Hanson-Runsvold afforded him the opportunity to do just that.